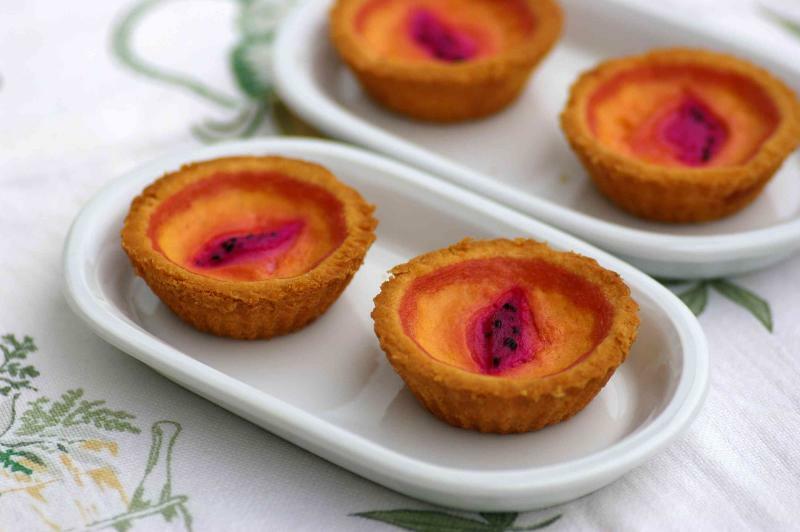 These sweet dragon fruit tarts will take you high up the popularity chart. Beat butter and sugar until creamy. Add in egg yolk and essence and mix well. Fold in flour and salt and mix into a firm dough. Knead dough lightly then wrap and chill in the refrigerator for 30 minutes. Roll out pastry and use as required. Whisk eggs and combine with dragon fruit puree until well blended. Pour in water and evaporated milk and strain filling. Preheat oven at 180°C. Pour filling into tart cases and arrange some dragon fruit slices on top. Bake for 15-20 minutes or until set.